It had been many years since I last visited my favorite kitchenware shop in Philly and what a joyful homecoming it was! 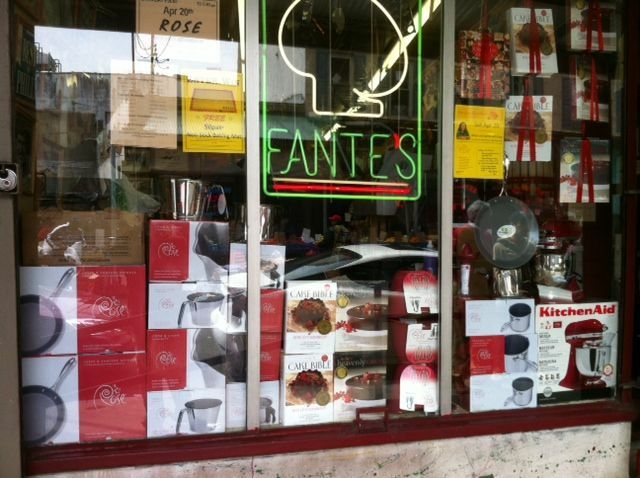 Fante's is located right in the middle of the vast Italian market. Bob Trinque and I drove down together and after finding a rare parking place were tempted by all the produce, sausages, and homemade cheese. But more exciting still was the incredible display of cookware at the store. It couldn't have been lovelier visiting with old friends, meeting new ones young and older, and showing off the new Rose™ line. And after the demo, Mariella Esposito treated us to the biggest and best Philadelphia cheese steak ever. I can't wait to go back for a longer visit!